PSL Designs would like to welcome back Nelle & Lizzy, Personalized, Hand-Stamped Jewelry. All redesigned and ready to go, check out their new site: www.nelleandlizzy.com . Nelle and Lizzy is sparkling new! This user friendly site has a great product personalization tool and is of course mobile friendly. Need a Valentines Day Gift? 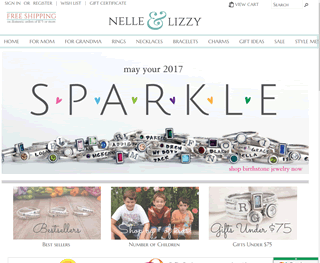 This would be a great time to checkout Nelle and Lizzy and get some bling for the special loved ones in your life. Next PostNext Certified ShopSite Designer & Developer!